Here is a great application which caters for all occasions and events and is free to use for home and business. What I liked about the Saas application was that you still send out your invitation as you normally would – for me it was Outlook merge – then RSVPhere does the rest all online. To setup the RSVPhere page is very simple and quick and you can have it done in 5 minutes if all you want is a basic RSVP form. But you can spend a bit of time and make it really slick by using some of the system style templates, like adding pictures to the page, not to mention a blog for people to comment and an area for pictures so that everyone can contribute to a gallery. Also the system allows you to ask questions of your invitees so that you can prepare a better event for them. 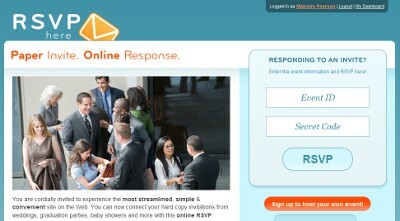 RSVPhere then gives you a code so that you can send people the link to RSVP online. In addition to this you can send a reminder closer to the date of the event and also an after event “thank you” to those who attended. As the RSVP list builds you can view it online or export it to an Excel spread sheet for things like name labels etc. This system looks really professional so I would suggest you give it a try with your next event.